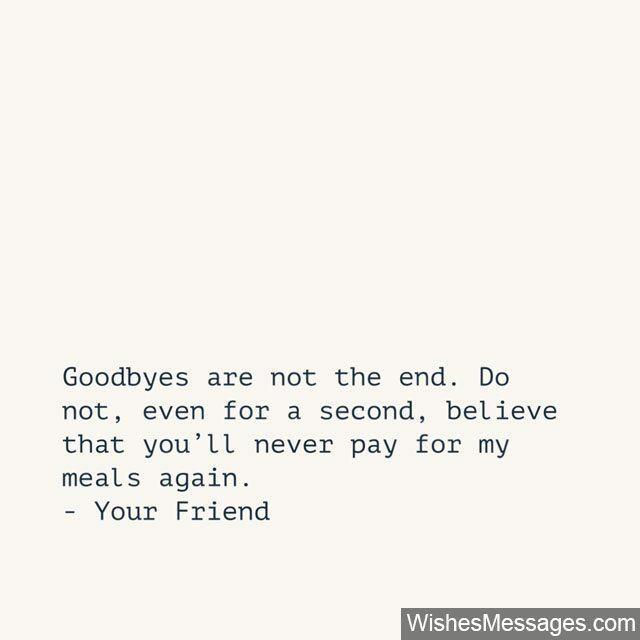 Funny Goodbye Messages for Friends: Tired of sad goodbye quotes? Well farewells don’t always need to be dull, especially if you’re giving your last hug to your best friends! Moving to another city, leaving for college, switching jobs – make sure the last moments you spend with your besties are an addition to the amazing pot of memories you have together. Yes, you can buy a dull and mundane greeting card from the shops but hey, don’t demean your friendship by doing that! 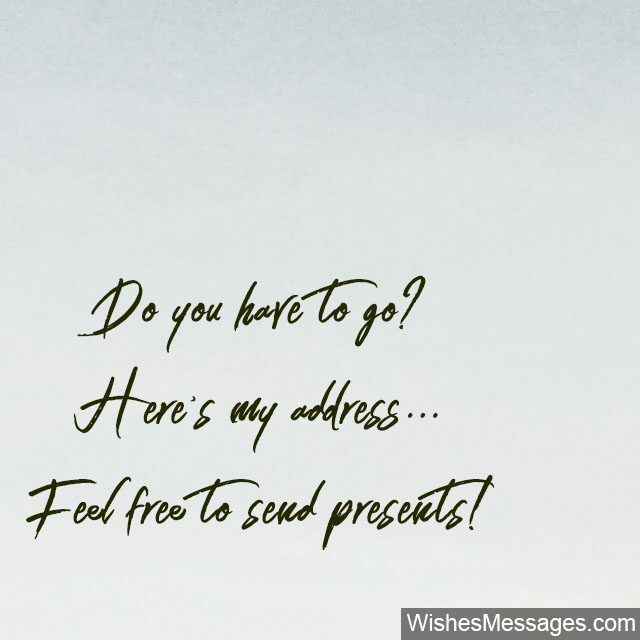 Be creative and write a sweet personalized message on a handwritten note. 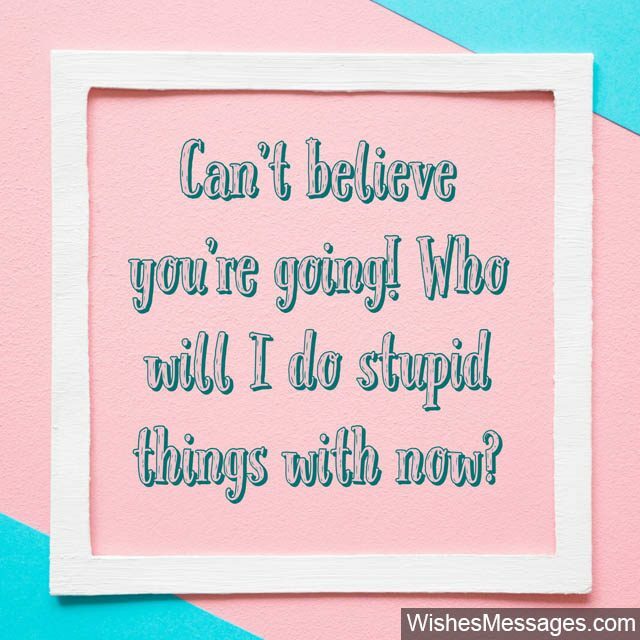 Give your message a humorous twist so that it isn’t just any other lame farewell quote. Think of the funniest memories you’ve shared and all the quirks that only you know about each other. Weave them into a few hilarious lines and put it up on Facebook, Twitter and Instagram too. While this may seem insignificant at the outset, cute gestures like these go a long way into creating bonds that last a lifetime. Goodbyes are not the end. Do not, even for a second, believe that you’ll never pay for my meals again. I honestly don’t know whether to smile or cry. I hate you for leaving me here, all alone, without my bestie by my side. How am I ever going to handle all these crazy people around me, without you? Who will tolerate my midnight rants? Who will I hang out with when I feel low? Who, who who? I hate you, and I hope you fail at whatever you set out to do… so you can come back and life can be normal again! Goodbye, NOT! Every time you feel alone, every time you feel lonely… just close your eyes and think about all the amazing gifts you’ll bring for me when you come back. Bye now! Goodluck finding better friends than me! Goodbye. Goodbye my friend, I hope our paths cross again… so I can punch you for leaving me in the first place! And to think of it, I was the only person who never judged when you farted. What will you do without me? Damn, who will be the stupid in my selfies now? Bye! Goodbye. You’re dead to me now. I’m not surprised you’re leaving. You’ve always been selfish! Goodbye but no thank you. I never felt bad about being a loser in life, because I always had likeminded friends like you around. What will I do now? Goodbye my friend. Oh, you’re going… who will I make fun of now? Bye! You’ve been convicted of Leaving Your Friend. Punishment is as follows: 2 phone calls daily, 2 selfies daily, 1 handwritten letter weekly and 1 in-person visit once every 3 months. 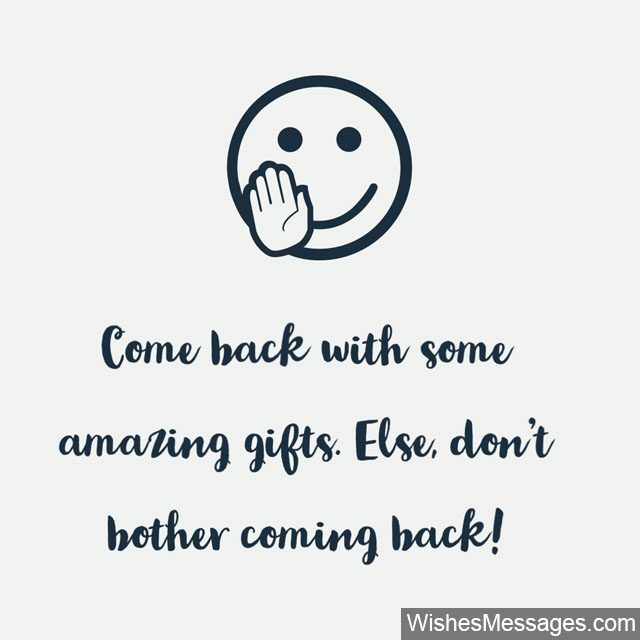 Come back with some amazing gifts. Else, don’t bother coming back. Goodbye! WHY ARE YOU LEAVING?? For your own sake, you better hope we meet again… else you have no idea how much I’ll put you in pain. This goodbye better not be forever, else you’ll be cursed by me forever! Can’t believe you’re going! Who will I do stupid things with now? Do you know the worst part of being away from friends? They’re the only people who won’t judge you when you fart. Never ever come back, unless of course you’re buying me a new iPhone! Wherever you are, never forget that you have a friend waiting for you to come back… with awesome presents! Goodbye. Goodbye my friend, it won’t be the same without you… it’ll be much better. The best part about having friends is that you always have someone to seek advice. Now that you’re going away, it’ll be chargeable by the minute. Looking forward! I can’t believe you’re leaving! I hope you fail at everything you do. See ya soon!